Scientists are testing a vaccine they believe could prevent heart disease and reverse damage to clogged arteries. It works by priming the immune system to recognise types of cholesterol in the blood as foreign, so that it attacks and destroys them. New Scientist magazine reports animal tests by Sweden's Lund University found the jab could significantly reduce the build up of harmful deposits. However, some experts have cast doubt on whether it would work on humans. There are big question marks over it. Professor Chris Packard, an expert in vascular biochemistry at Glasgow Royal Infirmary, said: "The theory is very attractive. "But there are big question marks over it." Professor Packard warned that while laboratory tests show the immune system can be primed to wipe out oxidised low-density lipoprotein - a form of cholesterol involved in heart disease - bigger studies showed little impact on heart attack rates. Heart disease is Britain's biggest killer. About 270,000 people suffer a heart attack every year and nearly one in three die before they even reach hospital. The government has set tough targets for the NHS in a bid to reduce heart-related mortality. By 2010, it wants deaths from heart disease slashed by 40% from when it took office in 1997, as part of a campaign to raise life expectancy by three years for men and two-and-a-half years for women. Fatty diets, lack of exercise and smoking are all known to contribute to the problem. But it is the physical changes deep inside the blood vessels that actually lead to a heart attack. These changes are mostly caused by a process called atherosclerosis. As cholesterol circulates in the blood, it begins to stick to the lining of the arteries. It then begins to oxidise, damaging the cells in the vessel wall in much the same way as rust rots a car. This process gradually causes a build-up of deposits called plaques. Scientists at Lund University in Sweden have been injecting mice with fragments of oxidised LDL to see if the body's self-defence mechanism will respond in the same as it does with infectious diseases. Mice given the LDL jab showed as much as a 70% reduction in the number of plaques, while existing plaques appeared to stop growing. In another experiment, the Swedish team injected the antibodies directly, rather than wait for the immune system to produce them in response to a vaccine. Results suggest this technique may also be effective. 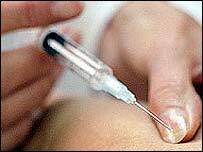 Scientists at Leiden University in the Netherlands recently reported a breakthrough in their search for a vaccine. It targets a chemical messenger called interleukin 12, thought to play an important part in the inflammation process. Professor Packard said the main problem with vaccines was that they targeted the immune system, which is already thought to be involved in triggering the inflammation process seen in heart disease. "We believe atherosclerosis (the formation of plaques) is an inflammatory process, so how can another inflammatory process combat that? It's a double-edged sword."